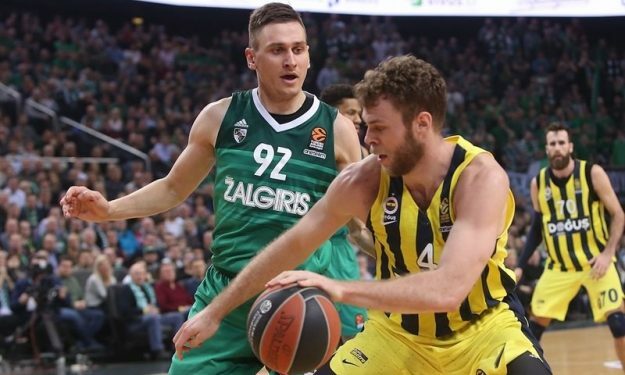 With the final round of the regular season upon us, we take a look at all the possible scenarios for the final EuroLeague playoffs pairings. CSKA Moscow has sealed the top spot in the standings, Fenerbahce ranks second, thus the rest of the pairings will be decided in the final round of the regular season. April 5th: Olimpia Milano vs. Panathinaikos, CSKA Moscow vs. Crvena Zvezda, Fenerbahce vs. Unicaja Malaga, Baskonia vs. Anadolu Efes. That being said, let’s check out the possible scenarios for the final standings. If Olympiacos beats Zalgiris, the team will finish third. Though this is possible even if Real conquers Bamberg and Panathinaikos gets the win vs. Milano. This way, all three teams will have an equal record, with the Reds being third, Panathinaikos forth and Madrid fifth. In case of a Zalgiris win, combined with Real’s victory and Panathinaikos’ defeat, Olympiacos will have an equal record with the Spanish team and will hold the advantage. A loss to Zalgiris, combined with a Panathinaikos win and a victory over Bamberg in Madrid, will place Olympiacos in the fourth position. With a win against Bamberg, Real seals off the fourth position in the final standings of the regular season, despite the equal record with Olympiacos (provided that the Reds beat Zalgiris). Madrid could finish fifth, given that Panathinaikos gets the win in Milano. If Panathinaikos loses to Milano and Olympiacos falls to Zalgiris, combined with a Real win against Bamberg, then Olympiacos will finish third, followed by Real, Zalgiris and Panathinaikos in the standings order. Panathinaikos currently ranks fifth and the most rational scenario seems that the Greens will remain there, with Olympiacos and Real getting respective wins. In case Zalgiris beats Olympiacos and Bamberg wins in Madrid, the Greens could finish third with a win again Milano. If the Kaunas side beats Olympiacos will finish sixth, pushing Baskonia to the seventh position. In case of a loss in Piraeus, a Baskonia win could lead Zalgiris to the seventh spot, given that the Spanish team has the advantage with +40 wins against the Lithuanians. Zalgiris could finish eighth, given that Khimki and Baskonia both win. In order to avoid CSKA and Fenerbahce, Khimki will have to prevail in Spain against Barcelona, combined with a Zalgiris and Baskonia loss. If that’s not the case, a Russian duel will occur in the playoffs, as Khimki will finish eighth. Baskonia is one win away from finishing sixth, since, as mentioned above, the Vitoria side holds the advantage against Zalgiris. However, a Baskonia loss, combined with a win over the Lithuanians in Piraeus, would mean that they will finish seventh and will face Fenerbahce. The whole picture will become clear as Thursday action is completed, especially with the games in Milan and Vitoria.